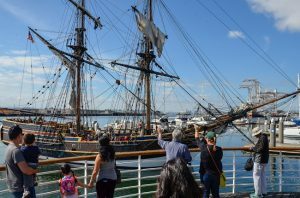 Oakland, Calif., 2019-Apr-12 — /Travel PR News/ — Two tall ships, Lady Washington and Hawaiian Chieftain, are in port at Jack London Square. The sailing vessels give visitors a glimpse of maritime history from the mid-1700’s to the late 1800’s. The ships are docked at the foot of Broadway through April 23, 2019. Vessel tours are open to the public for a suggested donation of $5 per person. Sailing guests for ticketed adventures can embark on a three-hour tall ship experience. Visitors will hear from crew about the challenges of moving people and cargo by sea in North America hundreds of years ago. Lady Washington is built to look like the first American vessel to make landfall on the West Coast of North America in 1788. The tall ship has appeared in movies and television shows including Pirates of the Caribbean: The Curse of the Black Pearl, Star Trek: Generations and Once Upon A Time. Originally designed for cargo trade among the Hawaiian Islands, the Hawaiian Chieftain is a replica of the Atlantic coastal sailing vessels in the second half of the 1800s. She was built of steel in Hawaii in 1988 and serves as a fast, topsail ketch that has been on both the Pacific and Atlantic oceans. The tall ships are part of the Grays Harbor Historical Seaport Authority (GHHSA) and the ship’s crew provides a variety of hands-on educational experiences. For more information on public tours and sailing schedules, go to http://historicalseaport.org. Transportation options to the Square include the Alameda/SF Bay Ferry, Amtrak, biking, walking and driving. The “Free B” shuttle runs on Broadway weekdays and is an easy connection from BART. For directions to the Oakland waterfront, please go here. The Port of Oakland oversees the Oakland Seaport, Oakland International Airport, and nearly 20 miles of waterfront including Jack London Square. The Port’s 5-year strategic plan – Growth with Care – pairs business expansion with community benefits, envisioning more jobs and economic stimulus as the Port grows. Together with its business partners, the Port supports more than 84,000 jobs in the region. Connect with the Port of Oakland and Oakland International Airport through Facebook, or with the Port on Twitter, YouTube, and at www.portofoakland.com. This entry was posted in Airports, Business, Festivals and Events, Transportation, Travel, Travel Management, Travel Services, Travelers and tagged Hawaiian Chieftain, history, Jack London Square, Lady Washington, Maritime, Port of Oakland, ships, Vessel tours. Bookmark the permalink.